St. Isidore (c.560-636), bishop of Seville was a prolific writer, perhaps his most famous work being the encyclopaedic 'Etymologies'. His 'Sentences' are a compilation of theological excerpts, arranged in three books, drawn mostly from St. Gregory the Great and St. Augustine. An inscription on a flyleaf suggests that this manuscript was perhaps owned during the Middle Ages by the Franciscan convent in Bristol. 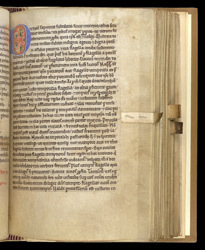 The start of Book III of the 'Sentences' has an initial 'D', five lines high, in blue, filled with ornament primarily in red and green. In the outer margin a vellum tab has been sewn in as a marker, making it easier for a reader to find this page.